We are having a blast learning about the life cycle of a butterfly. The main reason I waited to teach about the life cycle of a butterfly is because for our Kindergarten Graduation, we are going to do a reading of Eric Carle's, Very Hungry Caterpillar. 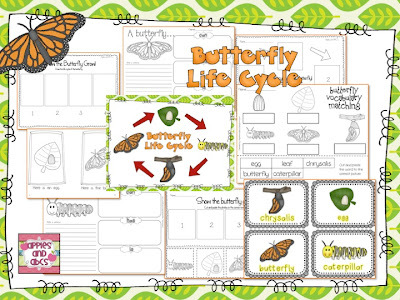 I started our butterfly unit by teaching all of the phases of the butterfly's life cycle. We read books, made butterfly crafts, and watched little video's on the life cycle. We made an Eric Carle bulletin board to have up for Graduation. 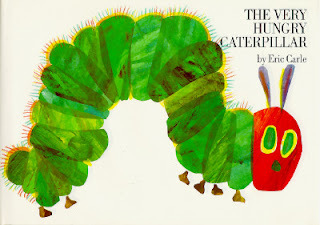 The first day, I read my kinders Eric Carle's, The Very Hungry Caterpillar. This book is great because it goes over all of the stages of the butterfly life cycle. We also watched the video clip of The Very Hungry Caterpillar on Youtube. I was also able to use the Butterfly Sequencing Kit from Lakeshore. After I did an overview of all of the stages, I went into detail teaching one stage a day. The first day we talked about the egg on a leaf. We made a little egg by cutting out a leaf in green construction paper, and then adding dots of glue with sliver glitter to make it look like little eggs on a leaf. Next we made our caterpillars. The students could color it however they wanted to! My favorite part was when we made cocoons by adding ripped paper bag pieces to construction paper, to add texture. Here, you can see the last stage: the butterfly! After we leaned about each butterfly stage, I assessed their knowledge, by having them place the stages in order. Another helpful tool, was using my Life Cycle of the Butterfly Unit. You can check it out in my TpT Store! I love that book!! Cute activities! Those cocoons are my favorite too! Everything looks great! omgosh! Love it!! Love the Chrysalis!! I love the details in the display. It looks beautiful! Love the cocoons! So cute! Cute activities...we just finished our unit up!! love the Very Hungry Caterpillar youtube clip - it's beautiful. I am currently in my first year teaching and I am teaching kindergarten! Our next Science big idea is Life Cycles and I am going to teach them about the life cycle of a butterfly! I LOVE the way you taught it! I was wondering where did you get your caterpillar, cocoon coloring sheets!? Where did you get the fat caterpillar coloring page?